Vallee is proud to be the prime consultant for the development of the new 5000-sq-ft Greenfield Dental Building located on Colborne Street in Simcoe, Ontario. This new dental building reflects both a commitment to the community and revitalization of the down town Simcoe core. 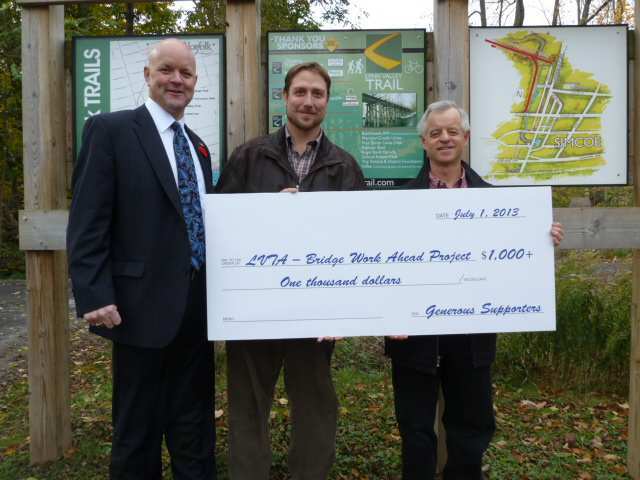 G. Douglas Vallee Limited is currently active on a unique project for Middlesex Centre. This municipality is very progressive regarding sustainable design and construction of buildings. With this goal in mind, Vallee has the role of Project Manager and Prime Consultant for the proposed fire hall in the community of Coldstream. Working with our team of specialty designers and sustainability experts, the Vallee team is working towards the design of a truly sustainable fire hall. It is our goal to design a truly Net Zero Energy / Carbon Neutral Fire Station. This means that over the course of a year, the building will generate an amount of energy equal to or greater than the amount of energy that the building consumes within a year. We believe that this may be the first Net Zero Energy / Carbon Neutral fire hall in Canada. We are currently looking to add a Civil Project Engineer to our team. For more information please visit our Career Opportunities page. We look forward to hearing from you! G. DOUGLAS VALLEE LIMITED, is proud to announce that Gary A. Peever, P.Eng., has acquired a license to practice as a Professional Engineer from Professional Engineers Ontario. Gary is a Norfolk County native, raised in Simcoe, and a graduate of Simcoe Composite School. He earned a Bachelor of Applied Science, Honours Civil Engineering, Faculty of Applied Science from the University of Windsor in 2009. He returned to Norfolk County and came to G. DOUGLAS VALLEE LIMITED in 2009 to continue his training and work toward obtaining his professional license. Gary’s field of practice at VALLEE within the Municipal / Land Development Department includes residential subdivisions and condominiums, site plan approvals and road reconstruction projects, working with local municipalities such as Norfolk, Haldimand, and Brant. His work also supports our Architectural Department, which includes custom homes, schools, churches, medical facilities and commercial projects. Please join us in congratulating Gary on reaching this important milestone in what we hope to be a long and fruitful career at G. DOUGLAS VALLEE LIMITED! G. DOUGLAS VALLEE LIMITED, now in it's 50thyear of service is excited to announce that Michael J. Rapai, P.Eng., has acquired a license to practice as a Professional Engineer from Professional Engineers Ontario. Mike is a Norfolk County native, raised in Delhi, and a graduate of Holy Trinity Catholic High School in Simcoe. He earned a Bachelor of Applied Science (Civil – Structural/Geotech Engineering) from the University of Ottawa in 2008. He began his engineering internship with a respected structural engineering firm in Ottawa. He returned to Norfolk County and came to G. DOUGLAS VALLEE LIMITED in 2009 to continue his training and work toward obtaining his professional license. 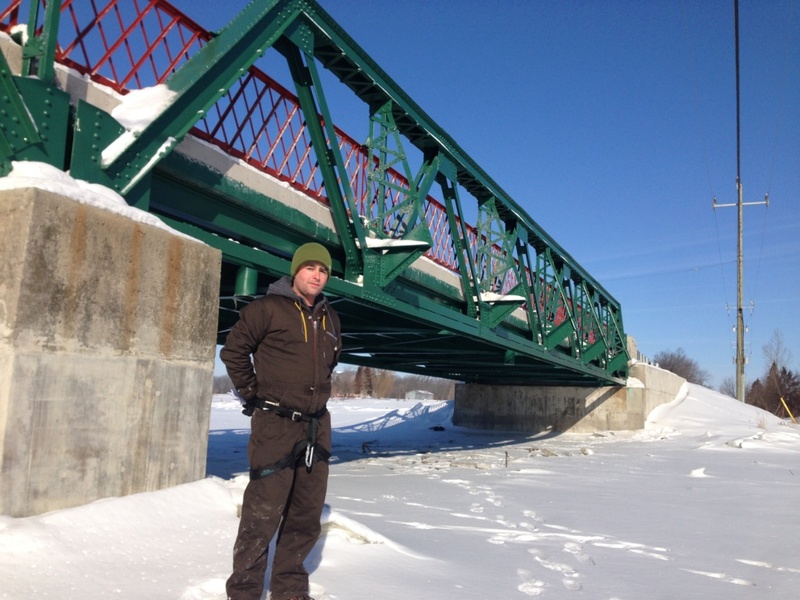 Mike’s primary field of practice at VALLEE within the Structural Engineering Department is bridge design and construction; working with local municipalities such as Norfolk, Haldimand, and Brant. His work also supports our Architectural Department, which includes custom homes, schools, churches, medical facilities and commercial projects. Please join us in congratulating Mike in reaching this important milestone in what we hope to be a long and fruitful career at G. DOUGLAS VALLEE LIMITED! Welcome to our redesigned website where you can upload and download the files that you need. Our clients now have the capability to upload their large documents and drawings without the use of a large file hosting server. We will now offer electronic tendering, not to worry if you need paper copies just call the office to request them. Please take a look around! If you're a regular client and think you would use this new service please visit the client section and register. We look forward to hearing from you! A big thank you to Lifeline Design for their excellent work and expertise in our redesign and for the high level of support and ease of use! Congratulations to the Lynn Valley Trail Association on the Grand Re-Opening of the 7.5km portion of the trail from Decou Road to Prospect St following bridge repairs and trail resurfacing. 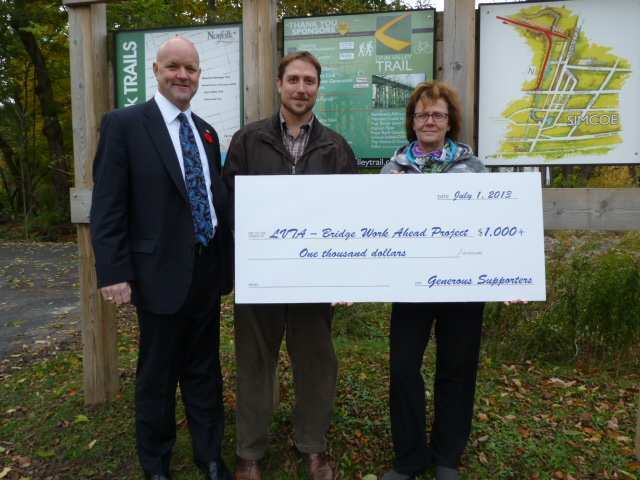 At a ceremony on October 20th a plaque was revealed at Silver Lake Park in Port Dover paying tribute to the major contributors who donated to the recent trail upgrades. 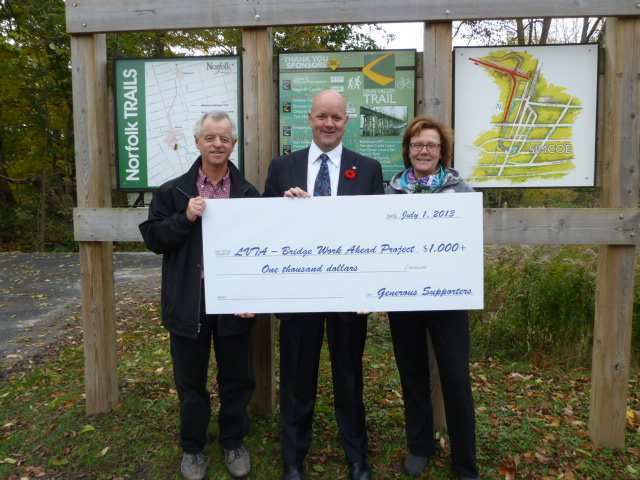 G. Douglas Vallee is honoured to be one of these donors. 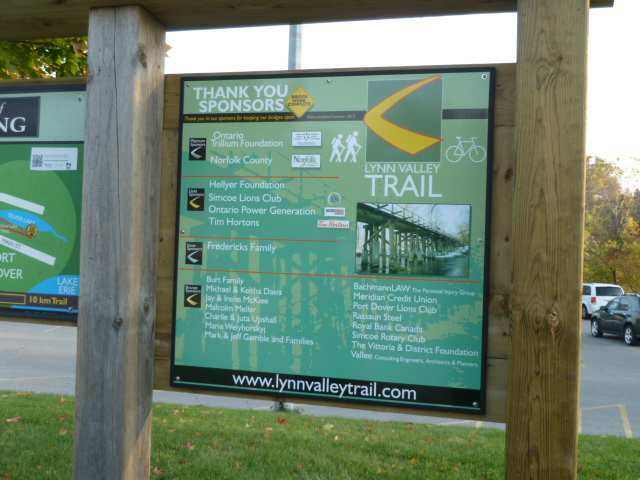 On a separate occasion at the Memorial Ball Park in Simcoe John Vallee and Ryan Elliott presented the Lynn Valley Trail Association with our contribution. "I just shared a slice of pizza with the Combine Gang in the new kitchen...and I'm speechless." Do yourselves a favour - make sure to walk through the front door at The Combine...and truly enjoy the voyage of getting to know the amazing food, the warm inviting atmosphere, and the incredibly talented people! Dare to change what you think you know about local cuisine!" Congrats again to Ryan and Jen! Please visit our portfolio for The Combine to see pics. Over the past few months there has been construction for Argyle Glen ongoing at the Norfolk Golf and Country Club. We will continue to post panoramic pictures of the site as it progresses.